Games software/hardware combined are set to drive more than $150 billion revenue for the first time ever in 2017, with software taking around three-quarters and hardware around one-quarter of the total (Note: this is games software/hardware combined – non-hardware revenues could deliver over $110 billion globally this year). 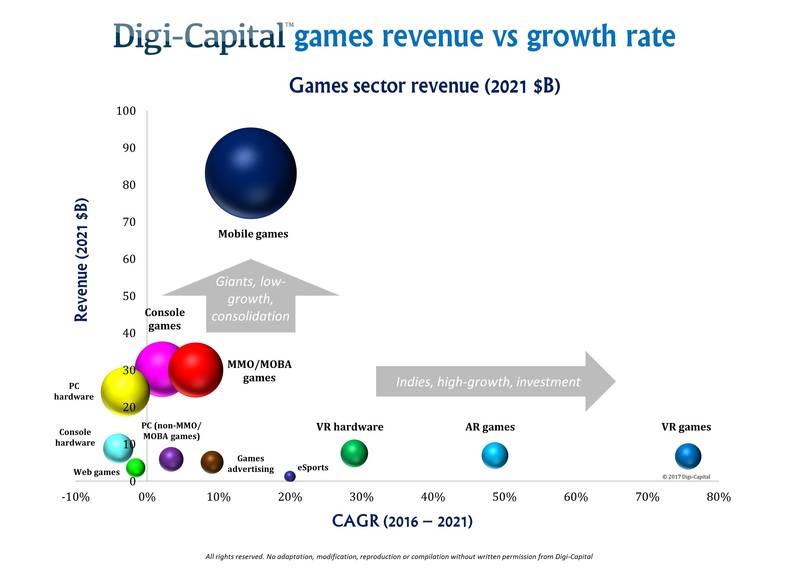 With a compound annual growth rate (CAGR) of 7.9% for the next 5 years, games software/hardware combined could top $200 billion by 2021 (as detailed in Digi-Capital’s new 200 page Games Report and Database Q3 2017). But not everyone’s a winner, as games has turned into a two speed market – giant sectors where giants rule, and small high-growth sectors where nimble indies can still make their mark. Mobile games have grown like a weed since the launch of the iPhone, and could top $50 billion revenue for the first time in 2017. Yet despite this outperformance, mobile games growth could slow to 14.5% CAGR to reach over $80 billion by 2021 (gross apps revenue across iOS, Google Play and all the Chinese app stores). 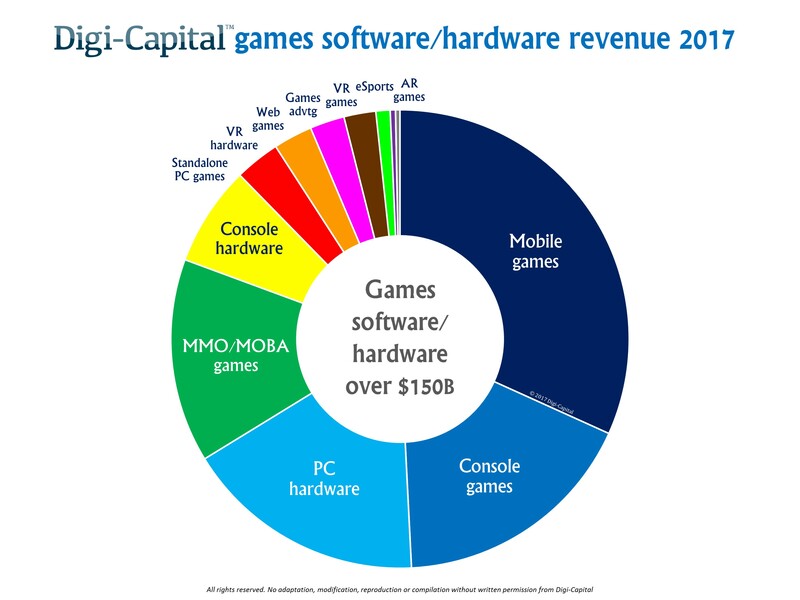 That’s more revenue than the entire games software market when we first covered it back in 2010 (coincidentally when we first forecast mobile games’ coming dominance, which folks thought outrageous back then). Console games and MMO/MOBA games should each deliver less revenue individually than mobile this year, and with slowing growth could each individually drive around $30 billion revenue in 5 years’ time. 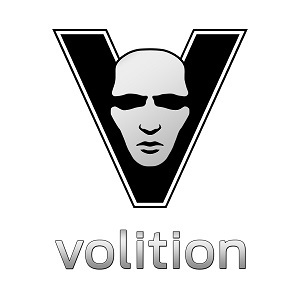 This could make mobile games bigger than console games and MMO/MOBA games combined by then. The remaining big sectors of PC hardware and console hardware are broadly ex-growth (although Nintendo Switch has given console hardware a big bump this year and might help longer term), but could still drive well over $30 billion combined revenue by 2021. At the other end of the scale is the land of the indies, where there’s room for them to breath. There isn’t enough money yet for the big boys, a little like early mobile games. VR hardware (headsets, peripherals and PCs/GPUs) could deliver in the low single digit billions range this year, and drive over $7 billion revenue by 2021. But VR hardware is dominated by giants like Facebook and Samsung already, so solutions for specific technical problems are probably best for startups in this sector. AR games software – particularly mobile AR games – had its first hit with Pokémon Go (even if industry insiders don’t like to call it AR). If mobile AR goes mass market in the next 12 months (helped by Facebook, Apple, Google and others), AR games software could drive almost $7 billion revenue in 5 years’ time – more than VR games. Pokémon Go might have made more money than all VR games combined last year, but VR games software still has a lot of runway. With high growth rates, VR games software could top $6 billion by 2021.
eSports is the last of the high-growth sectors, but despite serious investment there are still questions over just how big it could become in revenue terms. Combining the 50 major countries in our forecasts into regions gives a pretty consistent picture. 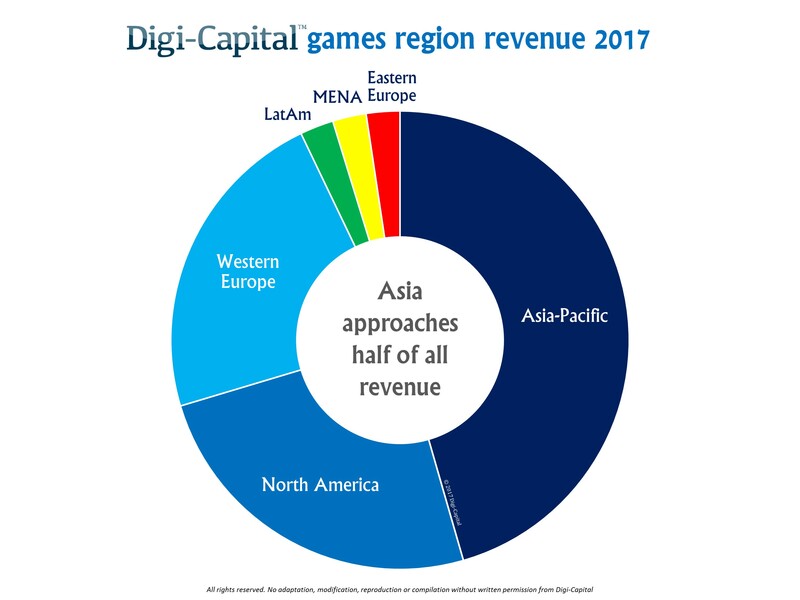 Led by China, Asia has dominated games revenue for the last few years (which we also forecast for the first time in 2010 to much bemusement) and that dominance looks set to continue. This year China, Japan and South Korea alone could deliver $4 of every $10 spent on games globally, and together with the rest of Asia-Pacific could see just under half of all games revenue globally. By comparison the North American market could take around a quarter of games revenue and Western Europe a fifth. In some of the hottest growth sectors such as VR games, AR games and eSports, Asia has changed from the outdated view of it being an importer of Western approaches to becoming a true innovator. 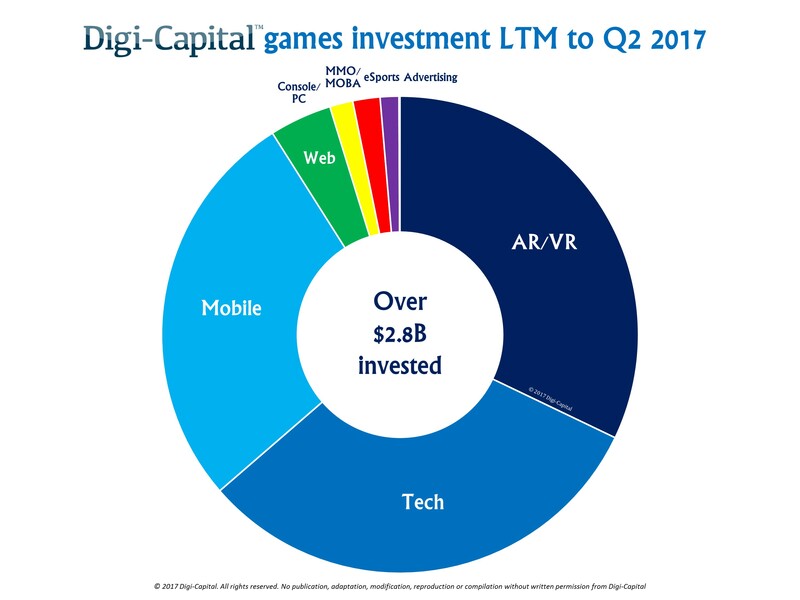 The last year has seen a resurgence in games investment, with over $2.8 billion invested globally in the last 12 months to Q2 2017 for a new record. 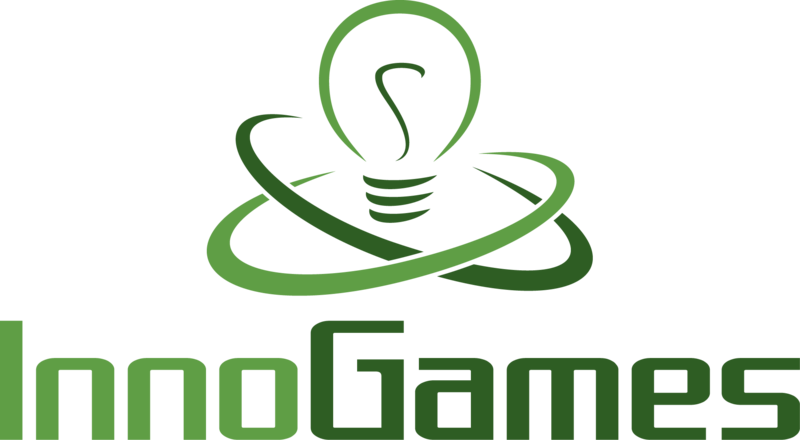 The previous high water mark for games investment was $2.4 billion for full-year 2014. On top of all that investment, Netmarble Games reopened the games IPO market by raising a stonking $2.3 billion in its IPO at over $11 billion market cap. Unsurprisingly, investment has been pouring into the highest growth sectors from our forecasts, with AR/VR and games tech/services each taking around one third, and mobile games around a quarter of all investment dollars. Similarly the money has been gratefully received by Chinese, American and (in the case of Netmarble) South Korean companies. With the industry hitting high scores across all the numbers that matter, now’s the time to tell your parents that working in games has become the sensible career option.